Sangeet Sadhana strives to preserve the integrity of Hindustani classical music. Nurturing the tradition and culture of performing arts, we aim to propagate the true authenticity of classical music to the present and the future generations. Spreading the joy of music, Sangeet Sadhana envisions bringing many more such aspiring musicians into the limelight. We take the responsibility of establishing the grace of classical music in the hearts of every music lover. We live the echoes of musical vibes, assimilating socio-cultural changes. The school shall continue to preserve and elevate the priceless heritage to the next level. Music is not limited to conventional gharana styles. Sangeet Sadana has developed a unique style of rendition which forms the signature of the institution, as the school has imbibed the best of all the gharanas. The school stands as a pillar of expression, constantly working towards upholding and strengthening the identity of our cultural heritage. Music is about shruti; it means purity of the 7 notes that exists in the universe to bring in peace. Swar is a living entity and sounds magical when pampered. Amidst the rise of various styles and genres of music, and the mindsets which consider music to be only for entertainment, we are here at Sangeet Sadhana to cast different innovations to make the process of learning classical music, an interesting and an attractive one, and to maintain the authenticity of Hindustani classical music. Music oscillating at Sangeet Sadhana is a package, enriched with the constructive influences of different gharanas; the core melodic approach to the Khayal gayki style and elongated alaap and its ornamentation of intricate taans are well evident. Instrumentals taught are diligent and efficacious. The gharana pays special attention to the raag and its feel. Every note echoing from the instruments characterize the emotion rendered by the raag. Layakari or the ornamentation of rhythm throughout the instrumental, takes quality of the performance towards divinity. Sangeet Sadhana reflects the principles and attributes acquired from the founder’s idol and guru, the veteran musician, VidhushiDeepali Nag. Flawlessness in rendition comes into picture only when we prioritize swar positions and shruti. The same maintains the purity of music. Getting engrossed in its melody transcends you to a different world where spirituality is invoked. The sense of satisfaction and enlightenment shall be all ours when we embrace the transcending transitions between the magical entities of music. Inculcating skills is a learning process which is complete only with the blessings and guidance of the guru. The more you are dedicated, passionate, hungry for knowledge, the better you learn; it all depends on how ready you are to surrender yourself to the guiding energy. Inspired by the same, Sangeet Sadhana follows the traditional Guru-shishya parampara. The gurus understand the disciples’ strengths and weaknesses along with guiding and shaping them into artists. No asset in the world is equivalent to the realness gifted to us by the divinity of this art. Being fortunate enough to experience such a pleasing wonder, culture and magic in itself is a privilege. Such is the power of music which delights every individual with its audio treat that music has to mesmerize us with. Beyond the boundaries and conventions, rules and grammars and all the other technicalities, celebrating the expression and emotion of rendition stands ultimate. Agra Gharana shelters two prodigious singing styles- Khayal and Dhrupad. The gharana majorly focuses on casting engrossment. The learning process revolves around culturing voice to add resonance in rendition. The alap outlines the intensity of the raag. Murkis add shimmer to the jewels of meendh and gamaks. As one of its salient properties, stands the art of associating vocals with taal throughout the performance. It is about not just manifesting Layakari, but also adding elements of significances to it. It all started with Pt. Gopal Nayak who shared the musical era with Ustad Amir Khusroh, the founder of Hindustani music. Pt Gopal Nayak belonged to Agra gharana and guided Haji Sujan Khan, who was succeeded by Dayam Khan and Qayam Khan. The son of Qayam Khan, was Khuda Baksh, who was succeeded by Ustad Faiyaz Khan, who was known as the sun of music. 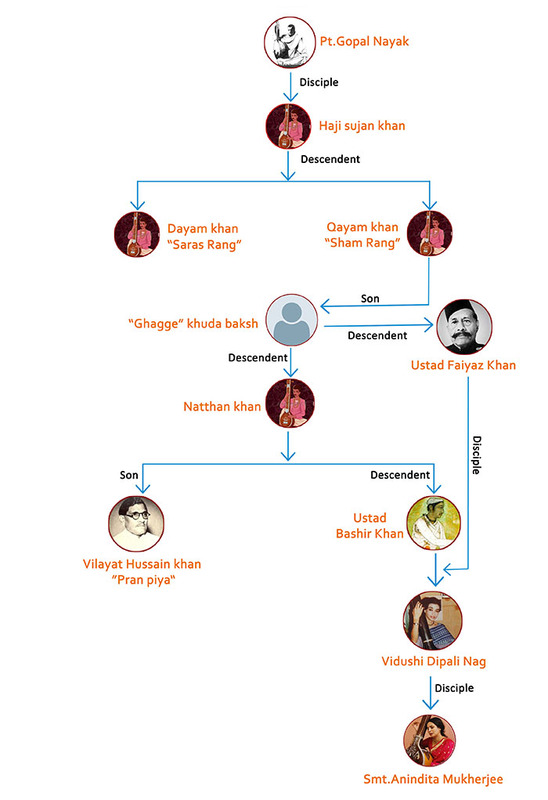 Vidushi Deepali Nag was the disciple of Bashir Khan and Ustad Faiyaz Khan. Called the first lady of Raag Pradhan, she was known for her staunch fidelity of Raag. Further, Smt. 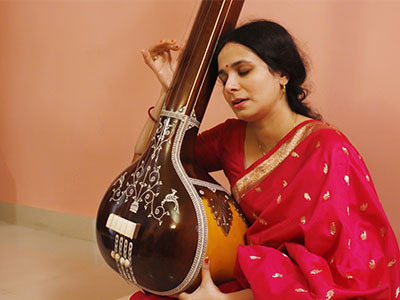 Anindita Mukherjee, the founder of Sangeet Sadhana, received full-fledged music trainingfrom her and also drew constructive influences from Vidushi Kishori Amonkar. Smt. Anindita Mukherjee, an All India Radio artist who developed a keen interest to learn, sing and inculcate the skills of music into her. She was only 5 years old when she started exploring the rays of melody and observing the minute details of music. Her curiosity to learn more and to get better eventually showered upon her, a great opportunity to meet and get trained from The First Lady of Raag Pradhan: Vidhushi Late Deepali Nag of Agra Gharana. Learning from her for 22 effectual years, Smt. Anindita established Sangeet Sadhana, School of music to uphold, propagate and preserve Hindustani classical music which blossomed in the year 2009. By implementing the lessons she obtained from Deepali ‘masi,’ she propounded a unique teaching-learning process owned by the school to fulfill the dreams of numerous music aspirants. The founder guru has introduced a unique brand of rendering melody featuring the 2 E’s of performing arts: expression and emotion, which form the trademark that identifies the institution. The teaching-learning process at Sangeet Sadhana, is a combination of both theoretical and practical knowledge. This includes Baithaks, workshops and research projects. The music aspirants are given exclusive opportunities to interact with the eminent artists and also to closely get connected to music through the flawless performances showcased by the maestros. Our inquisitive students work on research projects and the same demonstrates their interest and hunger to learn more. The initiatives taken by the disciples of Smt. Anindita to serve music, the fruitful collaborations with respected musical maestros and the true devotion towards this divine art form helped ripen the efforts of the founder for executing her creative ideas to shelter and foster the core values of Indian classical music. Sangeet Sadhana, with the support and guidance of all the gurus serving here, has and shall continue to serve as the promising institute breathing the purity and eminence of music in and out ever since 2009.